When we are dealing with paintball and paintball equipment, there is no RIGHT answer because we are all different and we all have different playing style. What could fit one paintball player might not be sufficient for other player. So, basically it is almost impossible to define what the best paintball mask available is. Many seasoned players stick to one specific brand and they will defend and praise their equipment heavily. 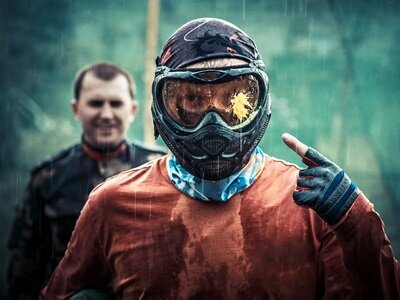 If there is no RIGHT answer in terms of what is The Best Paintball Mask, then why even continue reading this article? What we can do is to compare different brands, sizes, cost, features and then you will have enough information to figure out what mask will fit your personal playing style. 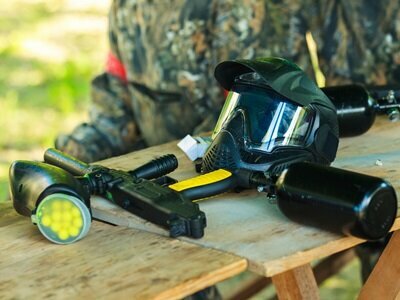 If you have never played the game of paintball, you will be able to find out what is the best mask to invest in for beginners. First off, let’s look at how we can label the masks. When describing masks, it is impossible to talk about masks as thin, short or wide. We should be referring to masks as being small profile or large profile. Now, what does that mean exactly? (Small-large profile). Basically, it is the cover area that your mask will occupy in your vision, from different angles. When you are playing aggressive style of paintball, this kind of information will come in handy. By aggressive style I mean speedball and during speedball, your mask and gun should be the only items exposed outside of your hiding place. Having said that, a small sized mask (small profile) would be your best option. With a small labeled mask, you are able to observe from behind your cover, without having to reveal un-needed portions of your face. One point to remember here is that on almost every field, if you get hit anywhere on your equipment or clothing, you will be eliminated from that gameplay. Therefore, what could be your best option, small or large profile? Smaller ones are ideal for speedball BUT it’s not a golden rule though. For players that prefer woodsball, mil-sim or scenario game-play, small or large will make no difference at all because of the nature of the game. What I mean is that in those types of paintball games, comfort is the key. Below, you will find the very best masks and I hope you can make an informed decision to purchase the mask that fits your playing style the best and a mask that will make you look awesome! 11 What Is a MASK? 12 How to Choose the Perfect Mask? The Dye I4 is one quality lens and ideal for outdoor paintball. Extremely comfortable and should fit perfectly medium-large (profile) sized head. Keep in mind that they might feel tight at the beginning but the adjustable straps will help you to modify further to fit your head. The straps are there to prevent the mask to fly off. It goes without saying that if you want your equipment to last, you need to take care of it. There is no reason to throw your mask on the ground in anger once you get hit. The best option is to invest in a protective bag or a case. You should take into consideration that your paintball goggles are long-term investment. Once you have found a paintball mask that you think you will like, you have to check the quality of the material, the price-tag and the reputation of the manufacturers. With the Dye I4, we have one of the top-rated paintball goggle that you can find. It is essential to have great goggles when you are playing. Actually, it is extremely hard to top the Dye Precision I4 Thermal Paintball Goggle simply because they are made of exceptional quality boasting features. It is extremely easy to use the Dye Precision I4 Thermal Paintball Goggle and the best part is that it does not leave any stain. Another factor is the vision that simply is impressive and there are no reports of paintball players having any trouble with the Dye Precision I4 and current owners constantly praise the ventilation technology. These goggles will provide you with a peripheral FOV (field of view). Having this FOV will help you spot your opponents in no time at all. This mask is very modern and nicely fashioned. It won’t include any visor that will get in your way. Even the lens contains a rounded shape that will make your playing experience easier and more comfortable. To sum it up, I highly recommend this mask for any player, beginner or experienced. 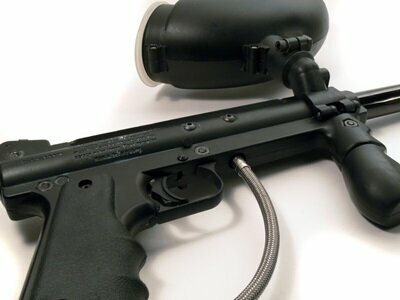 It is ideal for all kinds of paintball game-plays such as airball, xball, woodsball or just any game you intent to play. Also, they will work flawlessly no matter if it’s bright daylight or dark conditions. The only con that I can find is that your chin might be exposed a little bit if you have big jaws. You can go around this problem by wear some protective around the exposed area and that will make your gaming experience more joyful. Here we have one option for you if you want to look professional and experienced player then you should seriously consider the GXG XVSN Paintball Mask. If you look at the pictures of this mask, you can see that the look is quite frightening. This will come in handy when you are faced with any opponent in front of you. The GXG is another ideal option for those who are beginning and it will provide you with all the protection that any beginner will need playing the game of paintball. You need a mask to play paintball because if you wear a mask it will offer you protection to the most sensitive parts of your body, the face. That’s where the GXG XVSN kicks in! The design offers excellent protection for your whole face. The outer framework is manufactured from lightweight but sturdy material that will resist various type and amount of force/pressure from playing paintball. The interior is layered with padding fabric with support absorbing ability. In short, what that really means is that if you wear the mask, you will have sufficient protection on your face. This product is perfect to use indoors as well as outdoor and it is best suited for those who are beginning to play paintball. It’s extremely easy to clean and all you have to do is grab a small cloth and wipe the lens. It does a great job to protect you from accidents but is not overwhelming and big, it allows for ample breathing space. You should seriously consider the GXG XVSN if you are searching for a good quality and affordable paintball mask. The GXG XVSN provides exceptional protection, durability, comfort, plus they are easily adjustable and offer great air ventilation. They are ideal for starters and current owners love its effectiveness, so go ahead and check this mask out and decide for yourself if it will fit your playing style. When you think about it, the price-tag is extremely appealing. You might have to deal with a little fog or sweat while you are playing in intense climate, but that makes up for all the awesome features that this mask has. Given the price-tag and the quality production, this mask is very good. It looks “scary” in the eyes of your opponents. You can remove the mouthpieces if you wish and also you can remove the headpiece as well. If you remove both, it will leave you with only the goggles if you are in need to serious ventilation! With the Sports Elite, you have the option to choose comfort over protection or vice versa. All you have to do is to strap it on your head and once you adjust it to fit your head, you can go on and play without have to worry about your mask getting loose. It has adjustable fit that some user state that you won’t even realize that you are wearing a mask. One of the greatest features of this unit is its single lens that will always stay clean/clear in all environmental conditions. With this lens, you will have full-view of the paintball range and also your opponents. 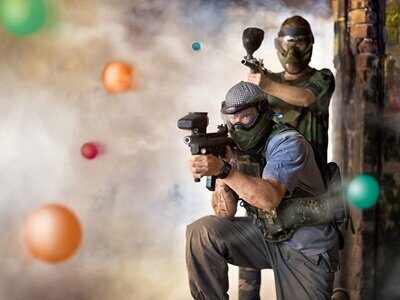 This will enable you to enhance your game-play and enjoy the game of paintball. Another great feature is that you can remove the visor and it will eliminate any sun glare. This mask will provide beginners with fantastic protective and comfort features. Although it might feel tight at the beginning, rest assured that this mask will provide you with excellent paintball experiences. The only downside is that sometimes (depends on the weather) fog can start to appear inside the lens. But overall, it will be close to impossible to beat the price tag on this one. It doesn’t matter if you are seasoned player or just making your first steps in the world of paintball, the E-flex is an option for those of you who are searching for comfort and style. I have been mentioning this over and over again in other articles, that nowadays paintball masks are becoming essential protective equipment and in some paintball places you won’t be able to enter the field without a mask. This mask is extremely durable and efficient for any paintball player regardless of skill or experience. You will receive excellent, durable and quality goggle that actually takes comfort to another level. Beautifully designed and easy to use for its functions. If you prefer value, versatility and comfort then this could be your perfect option. If you want goggles that you can assemble and dissemble quickly and effectively, the Empire E-flex is your option. It contains extremely comfortable design that provides your sufficient airflow. The soft flexible front allows you to easy assemble the lens when you are in a situation to change lenses. The advanced venting system will increase airflow inside the mask that will give you plenty of breathing space. This mask is excellent to use in all kind of weather conditions. This unit contains a dual pane thermal lens that will prevent any accumulated humidity or fog to appear on your lens. You can rest assured that you can play all day long without having to worry about humidity. The design provides you with 270- degrees viewing angle and once you look through the lens you will see stunning clarity. This product is extremely light weighted and comfortable to wear and one of the best feature is that it will give you plenty of breathing space. Having the ability to count on perfect air flow, leaving you with enough space to breath is extremely important, especially when you have been playing many hours throughout the day. The E-Flex is light compact that will not restrict you in any movements. Now we have gone through the highlights of all the features of this E-Flex mask and moreover we have covered main advantages and disadvantages. Having said that, it’s fair to conclude that this is one greatest mask for any paintball player regardless of their skill level. Beautifully designed that covers your whole head but at the same time offers comfort and ensures maximum functionality. You are able to invest in various styles and colors, to fit your personal preference. So, if you end up selecting the E-Flex, you will be able to play the game of paintball efficiently, comfortably and most of all, happily. The HK Army mask is one of the ground-breaking, most comfortable and customized paintball goggle that you can get your hands on. This unit is extremely well designed in terms of quality in order to give you all the satisfaction and comfort you will ever need in a mask. The HK Army contains HD, dual density, optically correct, PVT lock quick-change lens system, UV&IR shield and molded earpieces. Here we have a mask that is packed with newest technology that I’m sure you will appreciate and they are selling fast! You need to protect your ears as well as your front face. It hurts to be hit in the ear and if you don’t have ear protection it can really damage your hearing if the paintball hits directly inside your ear. With the HK Army mask your will receive ear protection that is extremely comfortable to wear and low profile as well. With this high-density ear piece, you can rest assured that your outer and inner ear will be completely protected and it will prevent any damage to the area around your ears. It offers extremely high-density and designed with quality in mind. This feature is extremely useful in paintball masks and once you experience the convenience, you will never go back to other masks that do not include ear protection. The HK Army will provide you with superior breathability while enhancing your movements during game play. It is made of thermoplastics and was built to offer superior protection around the most sensitive areas while still providing exceptional breathing space. This mask is one of the best masks available on the market today. So, feel free to browse through the review and I hope you can make up your mind and figure out if this mask is your perfect fit. The HK Army mask has gone through extensive production analysis and development and finally after many years and many tests the HK has now proudly released their most innovative and state-of-the-art mask/goggle model. It’s innovative, comfy, protective, durable and most of all, provides plenty of breathing space without limiting your movements. If you want quality, comfort and durability, I can highly recommend this mask and I seriously urge you to consider this option to enhance your paintball gameplay. There are many things you need to take into account when you are searching for the perfect match that fits your playing style. Here you have advanced model that will surely make you paintball game more joyful than before. If you are looking for a high-rated paintball mask that is virtually packed with all the features you could think of, then your option could be the Virtue VIO Contour Thermal Paintball Goggle. Having tried many of the brands out there, I can state that this is probably the most comfortable mask ever. What I love about this mask is the goggle because they have a lot of brilliant functions such as begin fog resistant and changeable foam. It doesn’t matter if you are a beginner or seasoned paintballer, this mask will blow your mind. This is the part where you attach your lens to inside the frame. The frame of the Virtue VIO features a special design in terms of frame. That is to say, you are able to customize the parts in a way that they can be removed, changed or replaced if you prefer so. You are able to buy the lens, straps and the face-mask separately if you want to customize your color preference. The most important part of the goggle is the frame and you are able to keep it in spite of the color you prefer to add. With this mask, you will get a big lens that will provide you with wide FOV (Field-of-View). It includes a thermal dual pane that will eliminate any humidity and fog. The Virtue VIO contains a lens in a spherical shape. You are able to enjoy a distortion-free view with this mask. One of the greatest feature of the lens itself is that it will not limit your peripheral vision in any way. It doesn’t matter what mask you buy, all of the manufacturers try to design the mask incorporating three things that are supposed to provide you with ample breathing space. However, not all of them are able to fulfill this feature. These three things are the goggle frame, spacing and venting. This mask includes all of these functions. The Virtue VIO includes ventilation both at the bottom and the top to provide maximum airflow. Another brilliant feature is the system that prevents your breath humidity to build up fog. This is done by allowing air to flow down and exit the goggle down. For anybody who is considering on investing in a top-rated goggle, then this mask is your perfect selection. They offer awesome design, breathability and comfortable to wear. You are able to customize your own color combination in various ways by investing in face-mask, goggle, lens separately. Overall, this is one of the best masks you will find and it’s highly favored among beginners and advanced players as well. If you think this mask will fit your playing style, please by all means consider this option. Here is a simple and stylish mask that breathes well and will eliminate any echo if you yell, thanks to its brilliant ventilation system. It’s extremely comfortable to wear and the foam is fantastic. You will get visor so rainy or shiny weather condition won’t affect your gameplay at all. The Vforce paintball mask includes a quick change lens and small profile that will feel comfortable on almost any head. This mask is definitely an option for you if you are looking for a versatile mask that will feel comfortable and will enhance your gameplay as well. It is extremely easy to maintain this mask. You can take it apart in seconds to clean it. Just remember to maintain your mask to enhance its durability and if you do so, it will last you many years to come. Easily scratched lens, requires extra care to last long. Strap loses elasticity quicker than the average mask. The goggle foam also has a fairly short life span. All in all, it’s low profile and easy to use, this mask could be your number one selection. It is basically packed with features and the price is extremely appealing. 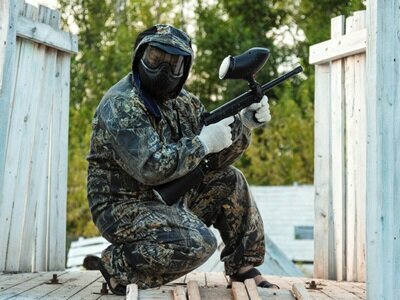 You will have to replace your equipment eventually, regardless of what type of paintball equipment it is. But, once you maintain your equipment properly, your equipment will last longer. Overall, VFORCE Grillz is a solid well received mask that current owners are extremely proud to wear and own. Here we have a mask that has it all and is extremely cost effective as well! In other words, in case you are searching for the very best beginners paintball mask at a reasonable cost that won’t break your bank, then consider this unit. Those who already own this mask are constantly praising the Empire mask because it has extremely appealing price tag and its ability to protect you if you get hit. This mask would be ideal for those who are taking their first steps in paintball. It provides both protection and comfort. This mask is so cheap that it’s not even worth it to rent a mask! I highly recommend this mask if you are just starting, there is nothing that can beat the price of this one when having the quality factors in mind. One of the best features of this mask is how easy it is to maintain and clean it. It has a comfortable fit as well as current owners claim that they hardly notice they are wearing a mask. If you have medium-large profile head, this mask is ideal for you. This mask is ideal for both indoor and outdoor play. If you want to be successful in the paintball game you should choose a mask that is able to prevent fogging. I mentioned several times here above that rental masks are not even worth it to rent if you have the option to buy the Empire mask. Rental masks and low quality masks will make your playing experience very frustrating and difficult because the inner lenses will most likely easily fill up with fog. However, that’s not the case with the Empire mask, it has intergraded anti-fog lens that will eliminate any fog or humidity on the inside. The success and popularity of this particular mask is its ability to last long hours of playing without even a single drop of accumulated humidity on the lens. Anti-fog feature is superb function and will just make your playing experience more joyful. It can be frustrated to play paintball if you are sweating a lot and sweat is dripping down your face. However, this mask is brilliantly designed to provide ventilation and quality air circulation. It will release accumulated warm air that would otherwise cause heavy breathing and even more excessive sweat. Those who currently own the Empire mask praise it for its unique freshness. So, if you are breathing fresh air, it means that the mask contains quality functional vents. It can be said about the Empire paintball lens that it was designed with simplicity in mind. This is one of the best beginner’s goggles that you can get your hands on. You will get wide vision, quality built design and excellent protection from getting hit. This unit is extremely sturdy and durable so you are properly protected for all kinds of rough games. Plus, the mask has extremely effective ventilation and anti-fog function so you can use it all kind of weather conditions. The final point to make here is that this is one of the cheapest masks available on the market. In this case, cheap is not bad because this model was built with quality and durability in mind and beginners will love this mask! It can be a daunting task to look for a perfect mask to fit your style of play and especially when you are seasoned player and you want a mask that is packed with features. You will see so many masks available that are extremely cheap with low quality design and these kinds of masks are not going to serve you well. Like I have said before, quality cost money and it goes without saying that you get what you pay for. Let’s now look at the Sly Profit Full Camo Goggles. Here we have a brand that has established itself in the paintball market and this mask is considered to be one of the very best paintball masks that you can get your hands on. The Sly production team has really taken the step forward and they have gone through a lot of research to maximize the durability and features to the fullest extent. The best thing about the Sly Profit goggles is that they will suit any kind of paintball player regardless of their skill level. You should consider to invest a little more than you intended in a mask, it is wise to invest in a high quality and durable paintball mask instead of going for a cheap, low-quality mask that will not last you for a long time. Current users are actually lost for words when they describe the Sly Profit and reviewers claim that this is the most comfortable mask that has ever been devolved. Once you put the mask on, it will restore the natural sized FOV (Field of View) and protects your face at the same time. You can even use the Sly Profit to correct your visual problems underwater! 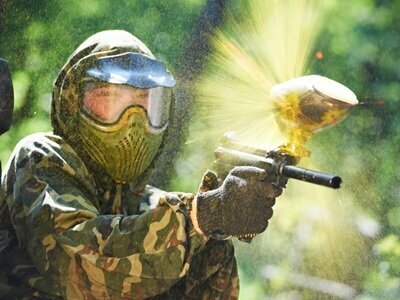 Experienced paintball players are always looking for the very best equipment to further boost their playing skills. They need a comfortable, well designed and quality mask that will protect their face while enhancing the vision. Those hard-core tournament players favor Sly Profit Full Camo Goggles simply for the fact that once you wear it, you hardly feel like you are wearing a mask. Furthermore, the fit is something that the Sly team has mastered. It is one of the top-rated masks to use while playing outdoors because of its innovated dark lens. Evidently, the objective of goggles is to prevent water, wind or dust to get into your eyes. There are many factors to take into account when we select our mask, such as the price tag, durability, reliability, comfort and fashion to name a few. This particular model includes a dark lens, awesomely structured frame and thermal lens which makes this brand extremely effective playing the great game of paintball. They Sly Profit masks are extremely durable, reliable and they suit any kind of paintball player regardless of their level of experience. In short, there are 4 parts that make up a mask. Those parts include Lens/Frame, Bottoms, Ears and Strap. I will go into more details about each part below. The shape and color vary between brands but generally speaking the functions are the same. Now, let’s look at each part in more detail. This is probably the most important feature of the mask. Once your lens takes out the shot, you will be grateful for wearing a mask. It will save you from the risk of getting blind, once hit. The lens main objective is to prevent paint from reaching your eyes and stop the paint but it also prevents smoke and dirt to sore your eyes. You will find many different lenses on the market but the main ones are single, dual and thermal lenses. Today, you are able to buy lenses that have different layers such as mirrored, smoke and UV resistant types. You can also get different frames that hold the lens. But why would you need a frame? Well, the frame secures the lens and attaches it to the mask. Different type of masks include intergraded frames and you can also invest in a removable lens. The bottom of the mask is the area below the lens. Below your lens are bottoms that will cover your chin and your neck. Moreover, bottoms are to protect your nose and cheeks also. When you breath, the bottoms will store all the air and include reticulate areas that are directed further back in order in order to avoid immediate contact with paint. This technology allows the mask to basically breathe with you instead of filling your mask with fog from your breath that will further block your vision. Ears of a mask will come in many styles. Ear styles include soft or hard touch and they can be tall or short. 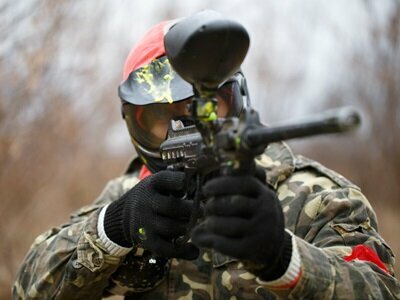 The main objective of the ear is to protect paintballs from making any damages to your ears. You won’t look like bugs bunny wearing your mask. They are designed to keep paintballs away from your ears and they will be thin enough for you to hear everything clearly, plus they protect your ears. The main objective of the straps is to hold the mask still on your head. But, straps can also be used to make your mask more personal. The prices and color options are endless and you don’t really need to throw out $150 for a strap. Do your research and compare prices if you want to change the straps of your mask. Now we have gone through the factors about what makes a mask a mask and now it’s time to investigate how you can choose your mask. How to Choose the Perfect Mask? To start with, you need to think about how much you want to invest, set your budget. It’s no lie that paintball is expensive sport. You need to buy new paintballs every time you play. Also, you will be stocking up paintballs in your garage or storage room in your house. It is important to set your budget and stick with it. Second, find out what kind of paintball you intend to play. As you know, there are various types of paintball games and you need to choose your mask accordingly because certain mask might not fit all types of paintball game. You need to choose a mask that you think will be comfortable to wear, it is vital, in order to enjoy the game of paintball. Let’s say you are playing a scenario game that will last the whole day, you crawl, jump, duck, slide and run through forest for hours and hours without a rest at all, in this kind of situation it is essential that you wear a mask that is comfortable and you have sufficient room to breathe. It doesn’t matter if your mask is small or large when you are playing scenario/Mil-Sim because your opponent has plenty of space to spot you and it makes no difference if your mask is small or large. Having said that, comfort is key element here and you need comfortable mask that provides proper ventilation. Finally, you need to invest in a mask that you like and equipment that feels good to wear. However, comfort should always be number one priority. I do realize that it has hard for you to decide if you should buy a mask that is comfortable when you are sitting behind your computer screen browsing through Amazon or other websites. If you can’t get hands-on experience of a mask, don’t worry. Once you have found a mask that has all the features that you have been looking for, you are able to purchase through Amazon and try the mask. If it doesn’t meet your expectations than you can return it without questions, in original packaging and with all the accessories you received. 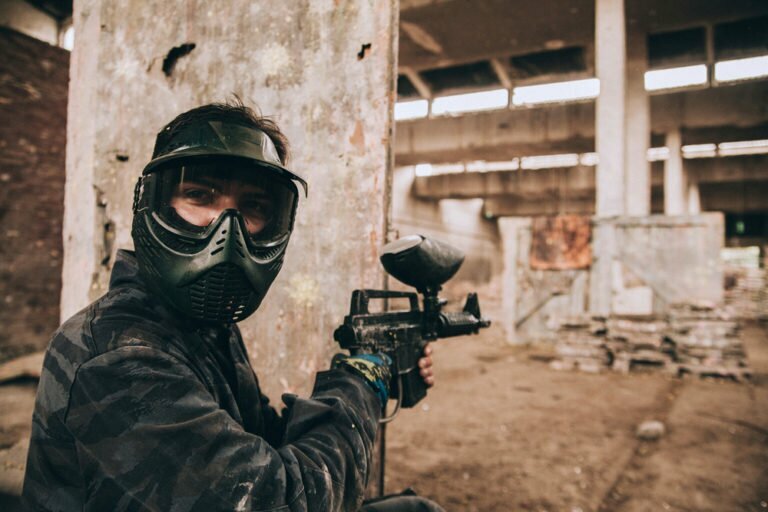 If you have a paintball store near your house, your best option is to try different masks on and feel what could be the most comfortable mask. It’s hard to describe the feeling once you have mastered your paintball gun, selected the most comfortable mask and all the other accessories that fit your playing style. Once your experience grows, you will begin investing in all kinds of accessories to enhance your playing skills and once you take your play to the next level, you will be on the lookout for the best equipment you can get your hands on. These additional accessories include food, paintballs, cloths, guns, masks and the list goes on and on. The mask is probably the most important equipment you need playing paintball and it will help you to stay safe. Please don’t head out on the field without a mask, you will be sorry once you get hit! You will most likely not be allowed to enter most paintball locations without wearing a mask for safety. Your face is one of the most sensitive parts of the body and if you don’t cover up your face, it will burn to be hit with a paintball, it can cause you some serious damage. Some of you out there might be worried how you look with a mask but masks are the standard thing nowadays and you can buy stunning masks that look awesome! You can even choose a mask that the military uses and will help you with camouflage as well. No matter what game-play you choose, masks can make your opponent think you are invincible. That’s about it, I hope this guide will help you to find your perfect mask that will most definitely enhance your playing experience. You will find the top-rated masks here on my website and these are the ones that get the highest customer ratings and the most popular ones available on the market.